Congratulations Eve on being recognized by CHAI Works as a Chai Champion! Eve’s most recent interview on Myndtalk with Dr. Pamela Brewer is an eye opening discussion about the past, present, and future of Voice Colors and Billy’s journey. You can listen to the podcast below! All Individuals, Even Nonverbal Individuals are Communicators: An Interview with Eve Megargel with Kate Swenson from Finding Coopers Voice. CaregiverCrossing has Eve Megargel back for a two-part interview. They talk about Caring for a Child with Autism and Behavioral Outbursts as a form of communication. Both parts are available to listen to below! Very Well interviews Eve Megargel for their article: How to Get High Quality Medical Care for Your Autistic Child. “Unfortunately, it can be a major challenge for people on the autism spectrum to get the medical treatment they need—even when they are verbal and engaged. It’s even harder for someone who is non-verbal, or whose behaviors appear to be out of control or violent. Local news station, ABC, spotlights Billy in his art-studio for their 5 for Good segment. CaregiverCrossing does a two-part interview with Eve Megargel about her book, Learning to Kiss. What a wonderful collaboration between ArtLifting and FedEx! This video features Billy and other artists who have found empowerment through art. To see more of Billy’s work follow WMMArtGallery on Facebook and Instagram or head to www.wmmartgallery.com. Mr. Dad podcast talks with Eve Megargel about her experience as a mother during a time when information about autism was scarce and developing communication systems for her son, Billy, that promotes independence. 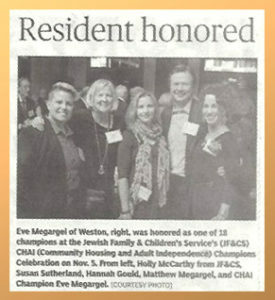 WellesleyWeston Magazine interviewed Eve Megargel about her book, Learning to Kiss, and dedication to advocating for her son, Billy. The article can be found here on wwmblog.com on page 166. ISAAC’s Blog Highlights Learning to Kiss. Billy Megargel is a non-verbal young man with autism. He is also an accomplished artist, a budding musician, and a self-fulfilled adult. Learning to Kiss is Billy’s remarkable story, beautifully written by his mother, Eve. See full post here! Easterseals Sits Down with Eve Megargel for a Q&A. “Today Billy is an artist, musician, and athlete. What can Billy’s experiences teach us? Every individual deserves respect as a communicator regardless of the modality. Every individual expresses purposeful and important messages. Popular Canadian Morning News Broadcast Interviews Eve Megargel. Here is more about the interview and autism. Washington DC’s local news station WUSATV, interviews Eve to hear about her book and creative son, Billy. Blogger Cafemom named Eve Megargel one of 14 Badass Moms Who Prove Motherhood & Activism Go Hand-in-Hand. “To say Eve Megargel is passionate about the autism community would be an understatement. Mother to Billy (Eve’s nonverbal and severely autistic son), Megargel has dedicated the last two decades to finding ways to help him become an independent communicator. Needless to say, it paid off. Thanks to Mom’s help, Billy paints, loves composing music, and can show you a thing or two as a yogi. Eve is now a part of Voice Colors® Communication Resource Model that empowers those on the autism spectrum to develop and strengthen methods of communicating that, in turn, make social interactions more practical and easier” See full article here! “Portrait of an Artist” article is now out in Real Simple Magazine’s July issue. It is a celebration for non-verbal communicators everywhere! Read the article here. Trailer for a film that highlights Billy’s independent self expression in movement! Q & A with Debora Kahl of deborakahlbooks.blogspot.com and Eve Megargel author of Learning to Kiss. “Q: Why did you decide to write this book, and what do you hope readers take away from it?